Hue city - the latest imperial capital of Vietnam under Nguyen dynasty (from the 17th to 19th century) is located in the central region of Vietnam, by the side of Perfume River (Song Huong), just a few miles inland from the East Sea. It is about 700 kilometers (438 miles) south of the national capital of Hanoi and about 1100 kilometers (690 miles) north of Hochiminh City. The city has gone through 7 centuries of establishment and development. 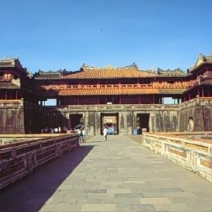 In 1802, Hue became Vietnam's capital when Emperor Gia Long, the first King of the Nguyen emperors (Nguyen dynasty), chose the location for the imperial city. The city remained to be the nation's capital until 1945. In the Vietnam War, Hue's central position placed it very near the border between North Vietnam and South Vietnam. Thanks to the long precious history, Hue has integrated material and spiritual values, which become its own unique special Culture. Hue is one of the main cultural, religious and educational centers of Vietnam. Architecture in Hue is the combination of royal architect, folk, religious ones, traditional and modern sides. Hue is also an important center of Buddhism. In Hue and the surroundings still exists tens of the pagodas which were constructed more than 300 years ago, and a hundred of temples and pagodas built in the early century. Thanks to the historical values, Hue receives much attention from travelers. There are a large number of Hue hotels Vietnam which can meet the demand of tourists when visiting the City. Copyright © 2012 Vietnamhotels.net. All rights reserved.